We are slowly (like at a snails pace) replacing our cheapo matchy living room set with more durable pieces that we love. I've been looking for a new couch that would go with our tufted couch we got two years ago for awhile now. We got a killer deal on that couch from Macy's and it has held up amazingly well so after finding a couch design that I liked and thought would go well with our other couch looked to see if Macy's had a similar style (an English roll arm sofa if you're wondering). I lucked out again and found a very similar style and it was at our local Macy's furniture store so we could go check it out in person. Even better, it was on sale. BUT, this was a couple of months ago when we weren't quite ready to buy it. I didn't worry too much about it because Macy's always seems to have sales, but when I checked on it last week, it was marked closeout and it wasn't listed as being available at any Macy's within 100 miles of us. A slight panic set in, but this past weekend we decided to head over to Macy's to just see if they had it. Despite the horrible phone pic and the child "running" in fear of it, I got photographic proof that they did in fact have it! (if you want to see a better pic you can click here) This was great since I initially was going for the love seat but after checking it out in person, we decided to get the couch. This proved to be a little difficult since it could no longer be ordered. After going back and forth a bunch we finally found out that they only had two couches left in the local warehouse that they could sell and we could only get it in "Amethyst" (the color pictured above). While a purple couch is a little out of our comfort zone and not everyone's cup of tea, we really like it on this style of couch and it should go really well with what we have planned for the living room so we went for it. 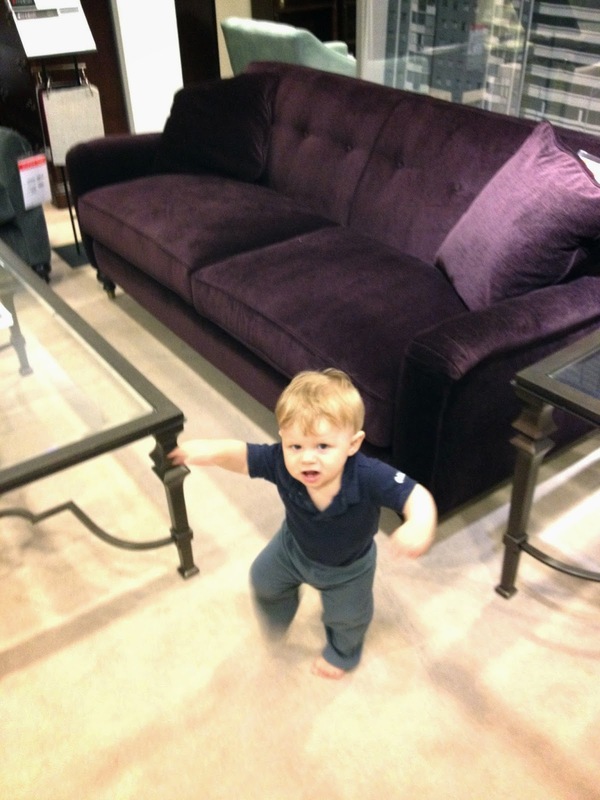 While Nate went through the process of actually buying the couch, Will entertained the staff with his toddling, knocking over of pamphlets, and bouncing on the beds. They were all so great with him and his "testing" of the merchandise. They even brought him old flyers to walk around with. I'm always nervous bringing him into stores like that but this was such a positive experience. So, that's the story of our purchase of the big purple couch. Well, besides the fact that it will be delivered on Tuesday and managed to score it for $350 off which includes shipping to the house. I have my candidacy proposal for my PhD on Tuesday so coming home to this will be my reward! I'm super excited! This is not a sponsored post. I've just had very good experiences with Macy's furniture and really appreciated how they treated us in store... with a baby.